New Zealand is a country of only four million people (and tens of millions of sheep!) but over the years we have had a few local designs pop up in the shops. To be honest, most of the games made in NZ aren't 'plugged in' to the global gaming community (which BGG represents) so roll-and-move and other fairly tedious mechanics are still frequently found. What's more, many games are 'education' focused . To date, only three or so NZ games have made it outside of the country, but we have a few others of interest. Maybe! I've left out a couple of games with no pictures or information and games I suspect are not locally designed. I encourage people to add more kiwi games! Flames of War! New Zealand's biggest gaming export! FoW is a great WW2 miniatures game with a 'lightness' equivalent to Warhammer 40k (last time I checked anyway). The miniatures are pretty, and reasonably priced, the rule books far sexier than most history-based miniatures games and it's doing extremely well. I know a few guys who gave up on GamesWorkshop and are thoroughly enjoying the "less evil" approach to miniatures game of the FoW crew. Interestingly, my family know Peter Simunovich, the founder of Battlefront (the publisher of FoW). Peter has a background in fishing and originally ran one of the biggest fishing companies in New Zealand. He's always been very keen on miniatures gaming, so for his retirement he decided to spend some money on the hobby he loved. Funnily, he says he now makes more money from Flames of War than he ever did fishing, which was never really his intention in the first place! 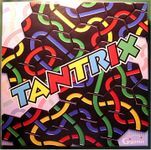 Tantrix would be New Zeland's most famous gaming export I'm guessing. 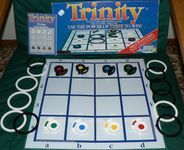 It can be found in most toy and book stores and tourist shops are known to stock it as well. 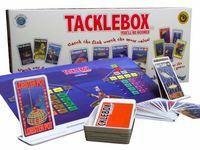 It's actually not a bad game - just not my thing as I'm not into abstracts. 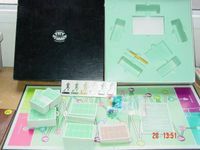 The components are nice, there are a few varieties, and it's spread its wings to a few other countries it seems. Well done Mike McManaway! 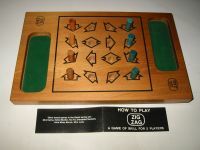 The precursor to Tantrix. Seeing the interesting yellow box triggers vague memories of maybe actually owning a copy. It's Probably in a box of old toys at my folks place. Mike's other design. From the looks of the busy Tantrix website he doesn't get a lot of time to design these days, being more involved with tournaments and whatnot! I'm adding IQIdeas as a whole, instead of their individual games, as they have four games out (two are variants). 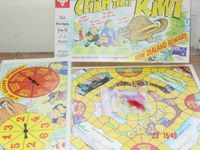 Their "The Amazing Moa Hunt" and "The Great Goanna Hunt" have attractive boards but simple roll-and-move gameplay that probably only appeals to kids. Their other games "FourSite" and "iQube" look like abstracts that might appeal to gamers who like that sort of thing. IQIdeas is Auckland-based and I hope we see some more interesting games (and some 'gamers games'!) from them in the future. 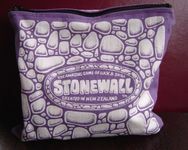 Stonewall seems to have been a one-off from the designers, described as "three friends and artists living in Katikati, New Zealand" (read: Hippies). 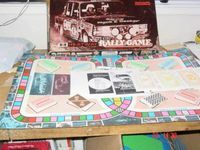 I was pleased to read that "All Stonewall games are made from renewable timber resources by artists living sustainable lifestyles Stonewallers believe that having fun should not harm our mother Earth." Couldn't agree more! But is it fun? No idea. I see it in a few shops here though. 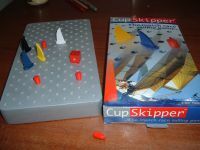 Another well known game from New Zealand. I only recently learned this was a Kiwi game. Pretty easy to find in most games and bookshops here. I think the attractive pieces definitely have added to its accessibility. Reputedly, the game is inspired by our fair city of Christchurch, which is the most English of our towns and features a canal where students will push you along on a punt (like Oxford) and a lovely (you guessed it) Cathedral. No other games from this gentleman though. A newer game from a local designer who, it appears, is more tapped-in to the Euro style and trends. 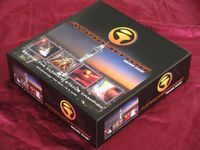 Television Empire is a card game whereby players run a TV network and try and earn more cash than their opponents by getting great shows, building their assets and even stealing each others anchors! It sounds pretty fun, but I've not read a review and the art might not be enticing enough to get friends/family interested. Age of Steam New Zealand map by Claude Parenteau. I haven't played AoS, but I imagine our interesting geography might make for a nice change fo AoS players. Plus, you can sing "Taumarunui on the Main Trunk Line" while playing! (Note: Taumarunui is pronounced 'Tao-Ma-Ra-Noo-Ee', run it all together and you'll be fine). Another sports game for the other national pass time. Not tried or seen this game around, but it looks like it might actually be a good one! It's the only game from this company and design team. Not seen it on the shelves or played this one either. I have never seen this on the shelves of shops, nor have I played it. It's the only game from this company, although one of the designers has a few other games under his belt. No roll and move, although it is 'educational'. Jim Deacove, the designer with other game credits (and some good kids games it seems), is Canadian, so we can't steal him for ourselves. Just as well, he has NINETY THREE games to his name - it would take forever to add them! 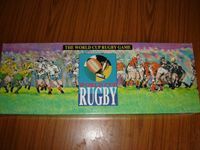 A Rugby game from 15 years ago. Never seen or played! Not seen or played, but designed by a fellow Wellingtonian! So it must be good. Nothing else on the 'geek from this designer. I seem to remember this game from back in the days of the sharemarket boom. Since then you'd probably only find this in thrift stores. 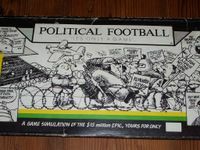 A game about the South African rugby tour of New Zealand in 1981. It was the most divided the country has been in my memory. South Africa, still practising Apartheid at the time, was under boycott by most countries in the world. However, sports competition often continued as not being strictly economic activity. Many people opposed to the South African regime believed New Zealand should have nothing to do with South Africa or its sportsmen so as to send a clear message. The rugby tour involved massive riots and demonstrations, including a light plane flour-bombing one of the games! Wow, a game from 1970! Never seen it, never heard of it, will probably forget it in a week. Old, New Zealand themed roll-and-move. I'm picking a New Zealander was at least involved in the making of this. I think you'd be lucky to find this anywhere, from the box art it looks like it was published decades ago. Rugby and trivia. Two things I have very little interest in. 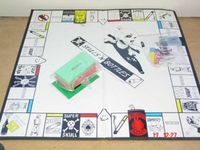 Drinking and Monopoly, all in one? Could be the only way to enjoy that thing. An abstract designed by another Kiwi. It actually looks quite interesting (for an abstract - as stated, I'm not a big fan). I don't recall seeing this one in shops so I'm not sure it lasted long, or even made it outside the country. A game for tourists to remember their fun time in New Zealand, it seems. Don't think this one survived for too long as I've never seen it anywhere. Another from Tourism Trade Enterprises Ltd. I don't think it fared any better than DestinatioNZ. It looks 'educational' so I'm sure that makes up for a lot! Probably a Kiwi-designed game? I'm picking so, although I can't find out. Never seen this one in shops or thrift stores. Here's one from the Quest series by The IQ Company of New Zealand. 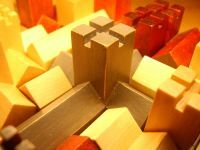 The series was characterised by having nice wooden bits. There might have been other original games in the series. 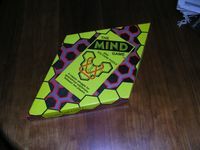 The IQ Company used to do neat puzzles too. Made in Auckland, and reviewed by Tom Vasel. Sounds like the game is cool, but fundamentally flawed. Shame, great bits it looks like. Tom V gave this game a terrible review, which was then 'debunked' by the game's creator, who did very little other than reference Monopoly. 'Nuff said. Another Roll and Move which seems to have been created completely unaware of how far the market has come in, say, the last 50 years. On behalf of New Zealand, I apologise, Tom.